Jason Masek, Stapleton resident and owner of Masek Golf Cars in Commerce City, shows one of his street legal golf cars near his home in Stapleton. 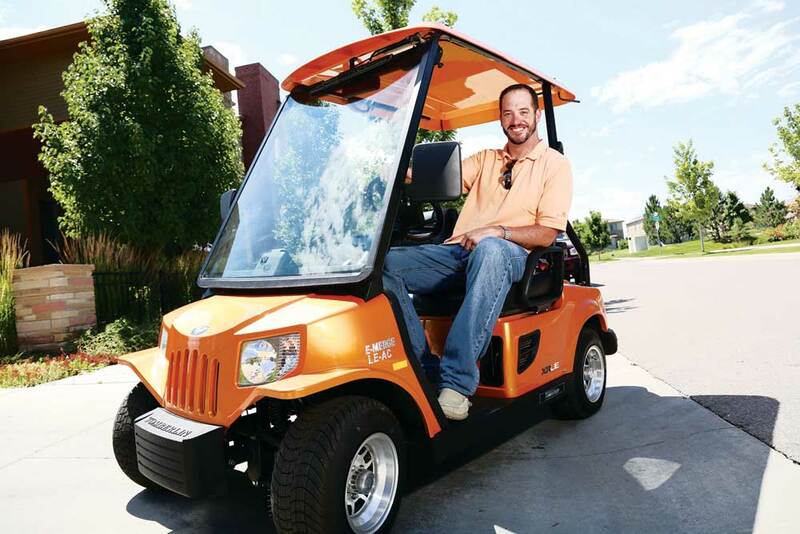 “It’s fun to drive a golf cart and feel the wind in your face,” says Stapleton resident Jason Masek, who has many opportunities to do so—he owns a golf cart (aka “car”) dealership. He can explain the differences between golf carts, personal transport vehicles (PTVs) and low speed electric vehicles (LSV); he can tell you what safety features the Denver ordinance on neighborhood electric vehicles requires; and he can tell you exactly what it takes to drive a golf cart legally in Commerce City, where he worked with city council when they approved their golf car ordinance. But he can’t tell you, for sure, what a Denver police officer would consider legal. That’s because there’s a disconnect between the Denver ordinance and the state’s definition of a golf car versus a motor vehicle. The Denver ordinance says an electrically powered, self-propelled neighborhood electric vehicle that does not exceed 35 miles per hour and meets the equipment standards set by both the state and the city is legal in Denver. Michael Joyce, a Denver city attorney, says under the city’s ordinance it doesn’t matter whether the vehicle is a golf cart that has been upgraded to meet all safety requirements or is an LSV that was originally manufactured to meet street-driving requirements. His concern is that the vehicle has the required safety equipment, it is driven on streets with a speed limit of 30 or under, and the driver is licensed and obeys all traffic laws. Joyce explains that Denver’s ordinance on golf carts was written in 1998 and preceeds the state law on golf carts and LSVs that was passed in 2009 (SB09-075). That state law defines a golf car as “not designed primarily for operation on roadways and designed to have a speed of less then 20 mph.” The same law says, “This article shall not be deemed to prevent local authorities… from authorizing and regulating the operation of golf cars on roadways by resolution or ordinance of the governing body… The law also specifically states circumstances when operation of a golf car is not authorized, including by a person under 14 years or on a state highway. By law in Colorado the state registers and licenses vehicles—and Joyce explained that the city leaves that function to the state. Kyle Boyd, Communication Specialist for the Title and Registration Section of the Division of Motor Vehicles, however, says, by law, they cannot register a golf cart because it was not originally manufactured as a motor vehicle. Golf cars have serial numbers, which are not accepted in the DMV system. The VIN (vehicle identification number) on motor vehicles certifies a manufacturer’s compliance with safety regulations. Since a vehicle without a VIN won’t be accepted by DMV’s system it can’t be registered or licensed. And state insurance requirements are attached to vehicles at registration, so there is no state mandated insurance requirement for a vehicle that can’t be registered. What does all that mean to the Denver police? District 5 Commander Les Perry says he understands that if there’s no state category for licensing golf carts, there’s no law on which to cite a person for not having a license plate. On the other hand, he understands that having unlicensed and potentially uninsured golf carts on the streets presents a safety hazard—and a police officer’s job is to ensure public safety. What’s the answer to the conundrum? Numerous cities have made golf carts legal and have created ordinances to address the issues of registration and licensing. Englewood, for example, requires that golf carts have proof of insurance consistent with state motor vehicle limits, they require a slow moving vehicle emblem and they must display a City of Englewood Golf Car permit sticker. Golf carts must be inspected by the police every three years to get the city golf cart sticker. The permit fee is $20. Show cause to legalize the cart. Implement a set of laws that are appropriate for the type of purpose the cart is to be used. I live in Littleton,Co., unicorporated Jefferson County,80127. What would be the first step,in the process of trying to llegalize golf carts or 4 wheel ATV,s on residential streets? If the vehicles and operators meet all saftey requirements I feel they should be legal, no more dangerous than a motorcycle.